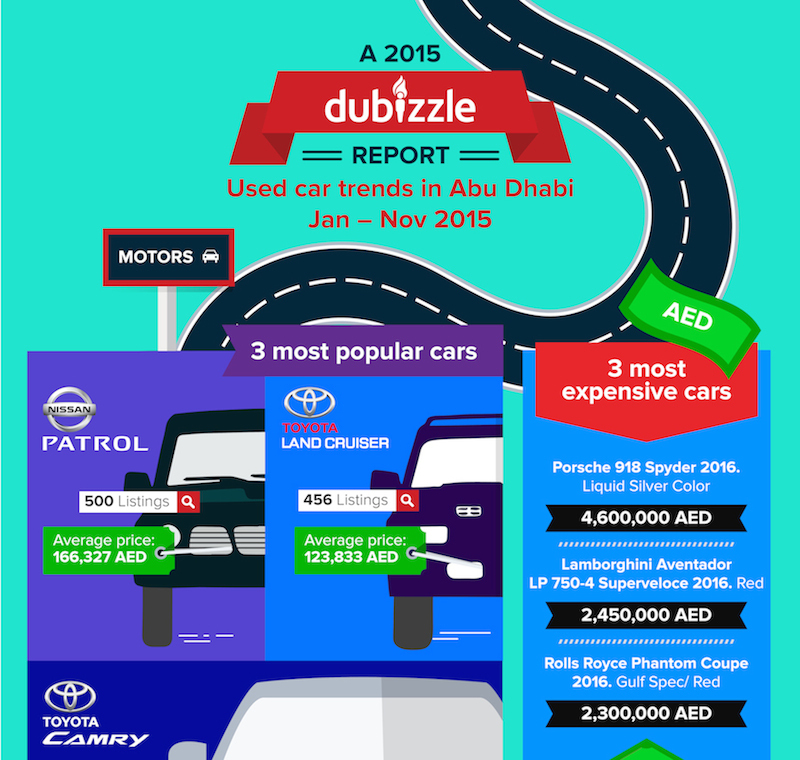 dubizzle, the leading classifieds website in the UAE, has unveiled its first ever Abu Dhabi motoring report, revealing never-seen-before insights into Abu Dhabi’s used car market. 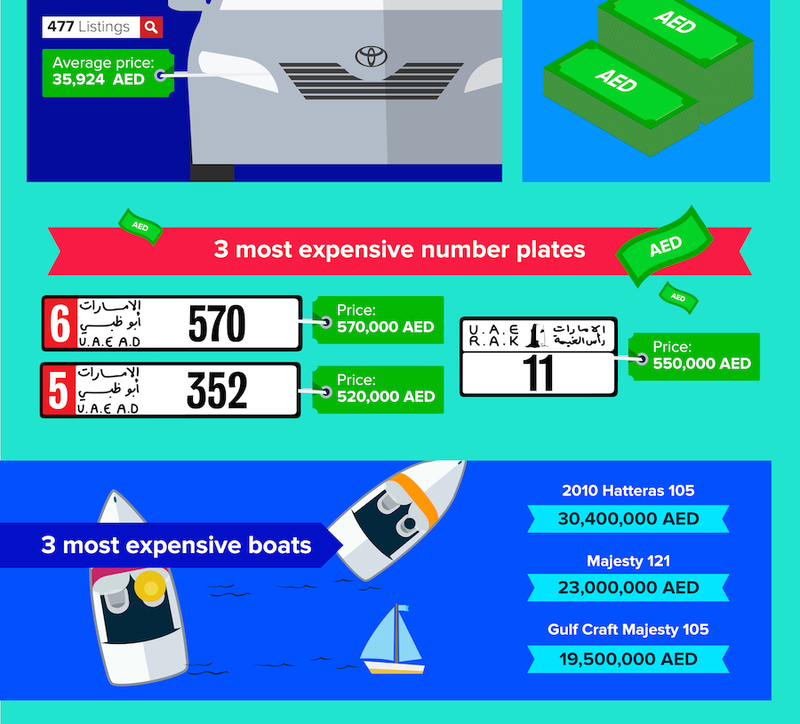 The comprehensive report reveals make and model of most expensive cars and yachts ever posted on dubizzle from Abu Dhabi. Brands like Honda, Jeep, AMG and Mercedes are the most popular brands in the capital according to dubizzle Abu Dhabi. In summary, over 5M visitors to the dubizzle motors section, with more than 125K car ads from Abu Dhabi placed from January to November 2015. The highest days for listings are Saturday and Sunday in the capital, while the peak hour of traffic is 1pm. Figures gathered between January and November this year reveal the number of car ads placed on dubizzle Abu Dhabi at over 125k with the Nissan Patrol recorded as the top car model sold on dubizzle during this time, with an average pricing of AED 166,327 and over 500 listings. The report reveals the most searched for car brands on dubizzle in Abu Dhabi as Toyota, Honda, Jeep, AMG and Mercedes, whilst black, white and red were reported as the most popular colours searched for on the motoring section. The three most expensive cars posted on dubizzle between January and November this year include the 2016 Porsche 918 Spider, 2016 Lamborghini Aventador LP 750-4 Superveloce and 2016 Rolls Royce Phantom Coupe, listed for AED 4.6 million, 2.45 million and 2.3 million respectively, and the number plate 570 code 6, listed at AED 570,000, was revealed as one of the most expensive number plates on dubizzle. Luxury yachts also topped this years report as the most expensive items listed on dubizzle from Abu Dhabi, with a 2010 Hatteras 105 posted on the site for a whopping AED 30.4 million. Osman Bhurgri, Product Marketing Manager – Autos at dubizzle UAE, said: “There is no doubt that the people of Abu Dhabi have a great passion for cars, with the recent Formula 1 Grand Prix event being a classic example of this. The auto industry in the UAE has continued to grow at a rapid pace, and the country remains one of the fastest growing automobile markets in the region. That being said, the used car market has also showcased some great resilience, and research has predicted by 2016, eight out of 10 people will buy a new or pre-owned car in the UAE.